Welcome to our UNICEF web page area where we will be updating you about our journey to become a Rights Respecting School. We achieved our Silver status in November 2017 and are aiming to achieve Gold by Summer 2019. Take a look at the exciting things that we have been doing at school! The RRSA recognises achievement in putting the United Nations Convention on the Rights of the Child (CRC) at the heart of a school’s planning, policies, practice and ethos. For a school to receive accreditation, it must evidence that it has reached the four standards of a Rights Respecting School. A school uses these standards and other guidance provided to plan and monitor progress. At Wyndcliffe we are working together to promote the United Nations Convention of the Rights of the Child (UNCRC) as a community. All adults within school are aware of their roles as ‘Duty Bearers’ and encourage children to enjoy their Rights. Every classroom has a class charter linked to the UNCRC, lessons are linked to articles, assemblies refer to the convention and our SDP and policies have articles attached to them. Through discussion in and outside the classroom, our children are recognising how their rights empower them and are using this to make positive changes in and outside of the school community. Language of the Month! Let's become Global Citizens by learning a little more about each other. On Tuesday 20th November the children of Wyndcliffe came to school dressed in blue to celebrate UNICEF's International Children's Day. We discussed how to keep safe in school, created school charters and linked them to the Global Goals. Aside from it being an interesting day linked to Rights, the children led the assemblies, handed out special awards to the staff and ensured everything they did was fun! Our children led the assemblies today! The Steering Group meet the governors of Wyndcliffe. We wanted to make sure that everybody who is part of our school community knew all about the RRSA so the Steering Group joined in a Governors meeting and introduced themselves. They told them all the hard work they have been doing to promote the RRSA and the fun they've had along the way. The governors were very impressed with the way the children presented themselves and their work. Well done! The Steering Group wanted a mascot to represent us as Rights Respecting Champions! They chose a lion because they felt he represented everything we are at Wyndcliffe; strong, fierce and united! He moves around each class holding an article to encourage the children to discuss our Rights. A short play, 'King Cruel' was performed by the steering group as a fun and interesting way to introduce him to the school. Check out our pictures below! On February 28th we celebrated International Mother Language Day- linked to Article 30 (Children from minority groups). We invited parents in to share stories, poems, songs and new vocabulary with children throughout the school. We learnt some Swedish, Somali, Bengali and Arabic on the day. Children also shared their home language with their friends by making posters, sharing vocabulary and telling stories. It was a lovely day! On Tuesday 23rd and Wednesday 24th January Wyndcliffe had some very special visitors in school! OFSTED visited us and we are very proud to say we are now a GOOD school with elements of outstanding! In the OFSTED report it was mentioned that children knew about their Rights. They recognised that the talking about our Rights has made an positive impact on our school community. Well done everybody! It is a new year for us and what a wonderful start it has been! We are looking forward to really getting involved in more Rights Respecting Activities to help us achieve our Gold Award. Congratulations everybody! Wyndcliffe has achieved the UNICEF RRSA Silver Award. On Thursday 23rd November 2018 Martin Russell from UNICEF RRSA came to visit us and carry out an assessment to see if we were ready for our Silver Award. He was very impressed that so many children and adults in our school community were able to talk about their Rights. Well done to everybody and make sure you keep talking about your Rights! On the first day back after the holidays, staff had a special UNICEF training session where they learnt about the importance of the UNCRC. Teachers and TA's will be responsible for making sure that they allow children to use their voices to promote the rights of the Convention. Parents were informed about the RRSA award in a newsletter. The Rights Respecting Rangers will be creating a special introductory video that will be right here very soon! A Rights Respecting Steering group (Rights Respecting Rangers) was set up to champion the award in school. They had their first meeting to discuss what they want to achieve and decided they will create a short video presentation to introduce themselves to the school community. Look out for it coming very soon right here! We achieved our Recognition of Commitment, which is the first step towards achieving the award. This involved making a plan about what we want to do over the next 12 months. Our certificate will be proudly displayed in the Beeches Reception area very soon. Meet your Rights Respecting Steering Group. 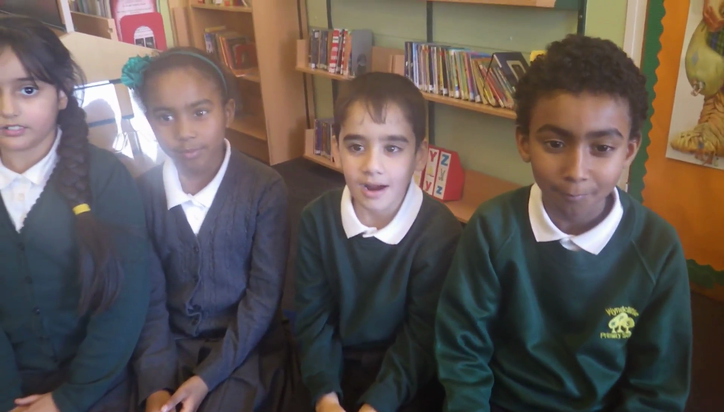 Our Rights Respecting Rangers have created a short video to introduce themselves. Look out for more videos coming soon. 'We've all got rights' is a fantastic song and animation by children and staff from Crosby High School, a Unicef UK Rights Respecting School in Liverpool. A child friendly version of the CRC. Why not try and learn the words to this fun song about having rights? This puppet show is informative and great fun to watch to learn more about the CRC. Hello to all the children of the world! A lovely song about saying hello to children all over!